Although he had been excommunicated from the Satsang for nearly three years, Pragji Bhakta had always impressed everyone by his saintliness, divyabhav towards all and ekantik sthiti. Thus, they all agreed to take him back into the Satsang fold. 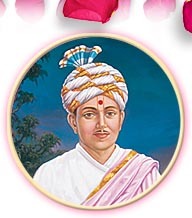 Due to his divine spiritual qualities everyone fondly called him ‘Bhagatji’. Now, Bhagatji (here onwards Pragji Bhagat will be referred as Bhagatji) shifted from Junagadh to Vartal and started accompanying the senior sadhus, Pavitranand Swami, Bhumanand Swami and Shuk Swami on their vicharan. Also, in accordance with the wishes of Acharya Maharaj, he delivered religious discourses during festivals and pleased the devotees. Girdharbhai failed to understand the significance of Maharaj’s advice. He thought, “How can a tailor, Pragji Bhakta, be the param ekantik bhakta? No, he can’t be.” He once again started praying to Maharaj. Maharaj again appeared and instructed Girdharbhai to associate with Pragji Bhakta. And so he went to see Bhagatji. His very first meeting with Bhagatji convinced him and he became his disciple. Gordhanbhai arranged for Girdharbhai to be given bhagwati diksha and he was named as Swami Vignandasji after renunciation. Kothari Bechar Bhagat assisted Gordhanbhai in his work at Vartal. Once, he asked Bhagatji to stitch a shirt for him. To his surprise, even though Bhagatji had not taken any measurements, the shirt was a perfect fit. Bechar Bhagat was pleased with Bhagatji’s skill. Bhagatji said, “This shirt will cover your body but I can prepare a shirt for your soul, too. But, for that you will have to come to my seat.” This aroused an air of curiosity in Bechar Bhagat. He went to Bhagatji’s seat and sought communion with him. He was greatly impressed by Bhagatji’s talks about atma and Paramatma. His desire for Bhagatji’s company increased and he became his disciple. In this way many pillars of Satsang were drawn towards the murti of Bhagatji. Once, Acharya Maharaj and the sadhus had gone to Anand. Every evening after the arti the Swaminarayan dhun was chanted. One evening Pavitranand Swami took objection. He said, “Since the time of Maharaj there has been a practice of chanting ‘Nar Narayan, Swami Narayan’. Why do you break this?” But the younger sadhus did not listen to him and started arguing with him. Pavitranand Swami could not tolerate the insult. He returned to Vartal and felt disturbed. So, he sent for Bhagatji and asked him to discourse to him. “In Satsang if one does not overcome ego, jealousy and other base instincts and does not become atmarup to offer devotion to God, one is completely exposed. To become atmarup one needs unbroken love for a great Sadhu like Mul Aksharbrahma Gunatitanand Swami.” Bhagatji narrated many such talks on the basis of the Vachanamrut and gave comfort to the greatly disturbed and agitated mind of Pavitranand Swami. He was now convinced that Bhagatji had become one with Gunatitanand Swami and had attained the brahmic state with his blessings. Soon after this, Pavitranand Swami passed away and returned to the abode of God. Due to some reason Kothari Bechar Bhagat was relieved from his duties by Kothari Gordhanbhai. When Bechar Bhagat went to see Bhagatji, he was rebuked by him for what he had done. Bhagatji talked to him about the greatness of a devotee of God and instructed him to apologise to Gordhanbhai. Bechar Bhagat had great love for Bhagatji, so he shed his false sense of pride and apologised. Then Bhagatji asked Gordhanbhai to use his good offices to arrange for Bechar Bhagat to be initiated by Acharya Maharaj. Bechar Bhagat renounced and was named Swami Mahapurushdas. Now that he was free from all the duties, Mahapurushdas absorbed himself completely in devotion to God.